The model layer has a central position in a play application (and in fact in all well designed applications). It is the demain-specific representation of the information on which the application operates. As we want to create a task management system, the model layer will contain classes like User, Project and Task. Because most model objects need to survive between application restarts, we have to save them in a persistent datastore. A common choice is to use a relational database. But because Java is an object oriented language, we will use an Object Relational Mapper to help reduce the impedance mismatch. Though Play does come with support for relational databases out of the box, there is nothing stopping you from using Play framework with a NoSQL database, in fact, this is a very common way to implement models in Play framework. However we will use a relational database for this tutorial. Ebean is a Java ORM library that aims to implement a very simple interface to mapping Java objects to the database. It uses JPA annotations for mapping classes to tables, but if you have had experience with JPA before, Ebean differs in that it is sessionless. This can greatly simplify the way you interact with the database, removing many of the surprises of things being done at odd times, such as session flushing, and errors with regards to stale or detached objects, that can occur when using JPA. The @Entity annotation marks this class as a managed Ebean entity, and the Model superclass automatically provides a set of useful JPA helpers that we will discover later. All fields of this class will be automatically persisted to the database. It’s not required that your model objects extend the play.db.ebean.Model class. You can use plain Ebean as well. But extending this class is a good choice in most cases as it will make a lot of the Ebean stuff easier. If you have used JPA before, you know that every JPA entity must provide an @Id property. In this case, we are choosing email to be the id field. The find field will be used to programatically make queries, which we will see later. Now if you’re a Java developer with any experience at all, warning sirens are probably clanging like mad at the sight of a public variable. In Java (as in other object-oriented languages), best practice says to make all fields private and provide accessors and mutators. This is to promote encapsulation, a concept critical to object oriented design. In fact, play takes care of that for you and automatically generates getters and setters while preserving encapsulation; we will see how it works later in this tutorial. Play has automatically detected that you’ve added a new model, and has generated a new evolution for it. 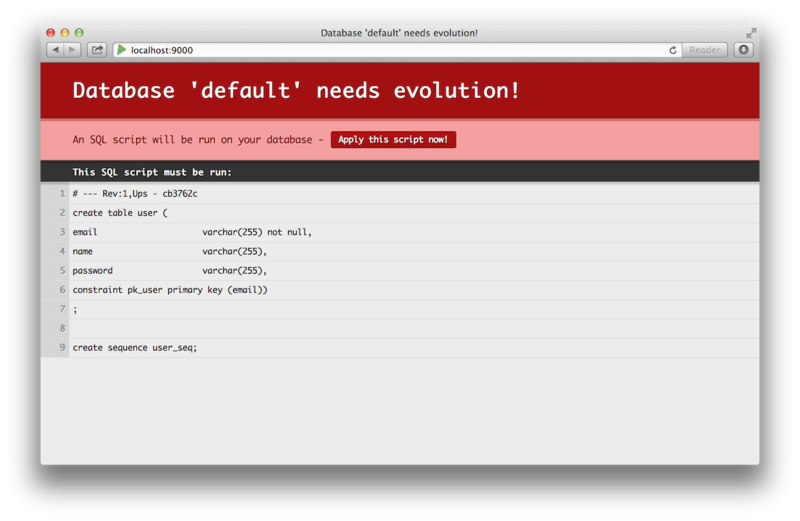 An evolution is an SQL script that migrates the database schema from one state to the next in your application. In our case, our database state is empty, and Play has generated scripts that create the tables. For now during the early stages of development, we will let Play to continue to generate these scripts for us. Later on in the project lifecycle, you will switch to writing them yourself. Each time you see this message, you can safe click the apply button. If you don’t want to have to worry about applying evolutions each time you restart play, you can disable this prompting by adding the argument -DapplyEvolutions.default=true when you run the play command. We have extended the WithApplication class. This is optional, it provides the start() method that allows us to easily start a fake application, and it automatically cleans it up after each test has run. You could manage these yourself, but we are going to let Play manage it for us. We have also implemented a @Before annotated method. This annotation means that this method will be run before each test. In our case we are starting a new FakeApplication, and configuring this application to use a new in memory database. Because we are using an in memory database, we don’t need to worry about clearing the database before each test, since a new clean database is created for us before each test. You can see that we have programatically created a query using the User.find finder, to find a unqiue instance where email is equal to Bob’s email address. To run this test case, make sure that you have stopped the running application by pressing Ctrl+D in the play console, and then run test. The test should pass. The above authentication code stores the password in cleartext. This is considered very bad practice, you should hash the password before storing it, and then hash it before running the query, but that is beyond the scope of this tutorial. A project has a name, a folder that it belongs to, and members. This time you can see that we again have the @Entity annotation on the class, extending Model, @Id on our id field and find for running queries. We have also declared a relation with the User class, declaring it as @ManyToMany. This means that each user can have be members of many projects, and each project can have many users. We have also implemented a create method. Note that the many to many members association has to saved explicitly. Note also that we never actually assign the id property. This is because we are going to let the database generate an id for us. Finally we have implemented another query method, one that finds all projects involving a particular user. You can see how the dot notation has been used to refer to the email property of User in the members list. Don’t forget to import java.util.List or you will get a compilation error. The last thing that we need for our model draft, and most important thing, is tasks. Each task has a generated id, a title, a flag to say whether it is done or not, a date that it must be completed by, a user it is assigned to, a folder and a project. The assignedTo and project relationships are mapped using @ManyToOne. This means a task may have one user, and one project, while each user may have many tasks assigned to them, and each project may have many tasks. We also have a simple query, this time finding all the todo tasks, that is, those tasks that aren’t done, assigned to a particular user, and a create method. Let’s write a test for this class as well. When you start to write more complex tests, you often need a set of data to test on. Creating and saving instances of Java classes can be quite cumbersome, for this reason, Play makes it easy to use YAML files to define Java objects, which you can then easily declare your data. When declaring data, be sure to use the YAML !! type operator to specify the model class of the data that you are declaring. Notice that this object is defined as part of a root object that is a list. We can now define more objects to be a part of that, however, our dataset is a little large, so you can download a full dataset here. You may find it more convenient to load the test data in your @Before method, so that the test data is available for every test. We have now finished a huge part of the task management system. Now that we have created and tested all these things, we can start to develop the web application itself. As you can see, some new files are not under version control. Add all the files, and commit your project. git commit -m "The model layer is ready"